The repatriation, in close cooperation with the Libyan authorities, the Burkina Faso Embassy in Tripoli and the IOM office in Burkina Faso, was by charter that departed Tripoli’s Mitiga Airport and arrived in Ouagadougou, the Burkinabe capital city. 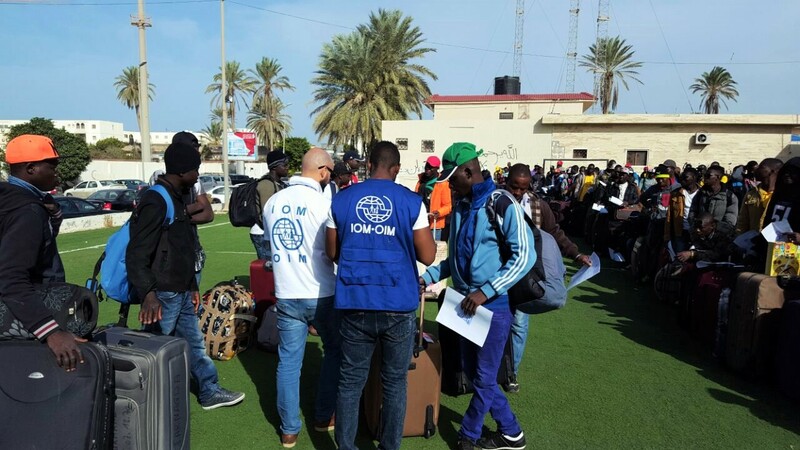 Before departure, all migrants stayed overnight at a shelter organized by the Burkinabe embassy in Tripoli, where IOM Libya staff provided food, drinks and hygiene kits. A mobile patrol from the Tripoli Security Committee then escorted the buses to Mitiga airport. Among the migrants was 30-year-old Feras* who had migrated to Libya for work. One day, a car stopped next to him as he was walking on the road and demanded that he get in, when he refused one of the passengers started shooting. Feras was hit multiple times before the car drove off, leaving him bleeding on the pavement. Badly wounded, he was admitted to Abu Sleem hospital in Tripoli. Suffering from several leg fractures, he was immediately taken into surgery and after two months of intensive hospital treatment, the Burkina Faso Embassy coordinated with IOM and facilitated his return home. Grateful for the support, Feras is now happily back in his country. Upon return to Burkina Faso, Feras and the other migrants, were received by the Ministry of Foreign Affairs, Cooperation and Burkinabe Abroad, the National Solidarity and Family society and the IOM Country Office in Burkina Faso. Furthermore, all migrants were supported with onward transportation grants to facilitate their transportation to their final destination within the country. In addition, 20 of the most vulnerable migrants were allocated in-kind reintegration assistance. The funds for the charter were provided by the UN Central Emergency Response Fund, Norwegian Ministry of Foreign Affairs and the Permanent Mission of Italy to the United Nations and international organizations. *Feras is not the migrant’s real name.